A large portion of DC power systems these days don’t come with any protection to stop the battery from being completely drained away when loads are running. Over discharging a battery can and will shorten its overall lifespan and performance. By simply installing a “Low Battery Cut-Out” device in your DC system, this will prevent the batteries from being deeply discharged and also protect the attached equipment from low voltage disconnections. The ePOWER Low Battery Cut-Out is a solid-state device that will protect batteries from damage and help extend life by preventing over-discharge. The unit monitors battery voltage and will disconnect equipment when the voltage falls below a programmable pre-set voltage. These Low Battery Cut-Outs also protect connected electrical appliances against over voltage. The voltage load is disconnected whenever the DC voltage goes beyond 16V (12V mode) or 32V (24V mode). Microprocessor Controlled; The ePOWER LBC is microprocessor controlled with 10 different user defined programs that engage or disengage the voltage load over several different voltage parameters. 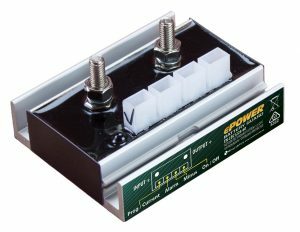 40A units and above can also be wired up as a manual override DC disconnect switch to completely de-power your system when required. The Low Battery Cut-Outs range in size from 10A to 200A and will suit any 12v application requiring protection for the battery bank.